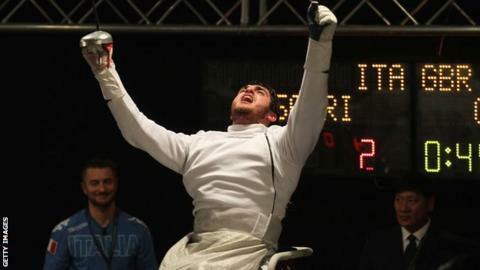 Britain's Dimitri Coutya claimed two gold medals at the Wheelchair Fencing World Championships in Rome. The 20-year-old world number one beat Anton Datsko of Ukraine 15-9 in the men's category B foil final on day one. He followed it up with gold in the epee, overcoming Iraq's defending champion Ali Ammar in the semi-final before a 15-14 win over home favourite Alessio Sarri in the final. Meanwhile, fellow Briton Piers Gilliver came away with a silver and bronze. The Rio Paralympic silver medallist lost in the men's category A epee final on Thursday against Russia's Maxim Shaburov. His third-place finish came in the sabre - an event he started competing in this season.